Whether it is your party dress or a simple pair of jeans and a T-shirt, this tan sling bag from Lino Perros} will surely spruce up your look. 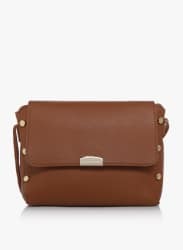 The design of this sling bag is worth noticing. Made from synthetic leather, this sling bag is durable and lightweight. The zip closure ensures safety of your belongings, while the long, detachable shoulder strap allows you to carry it as a sling bag too.